Walking around the shopping mall and can’t decide on what to eat? Why not treat yourself to a Mcdonald’s meal and get their limited edition custom gift set! 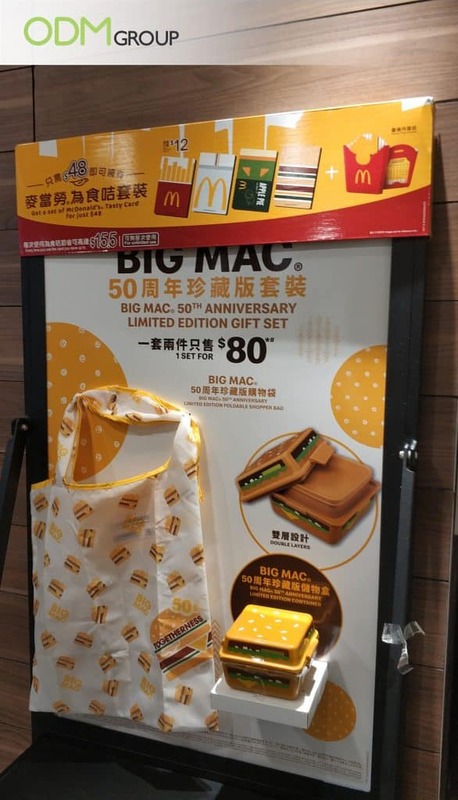 To celebrate Big Mac’s 50th anniversary, Mcdonald’s in Zhuhai is offering a marketing gift set for 80RMB (11.50 USD)! The limited edition promotional gift consists of a foldable shopping bag and a container. 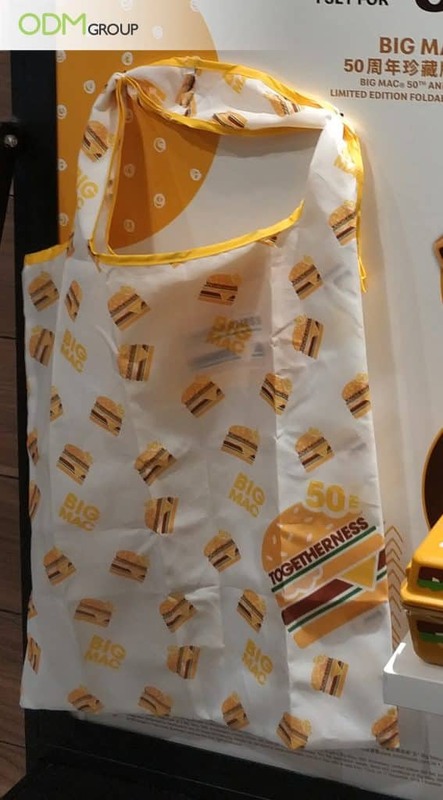 The design of the shopping bag giveaway flaunts many Big Macs which helps with brand recall. Moreover, ‘togetherness’ printed on the design provides a sense of connection to consumers. The design is certainly quirky and unique in its own way! 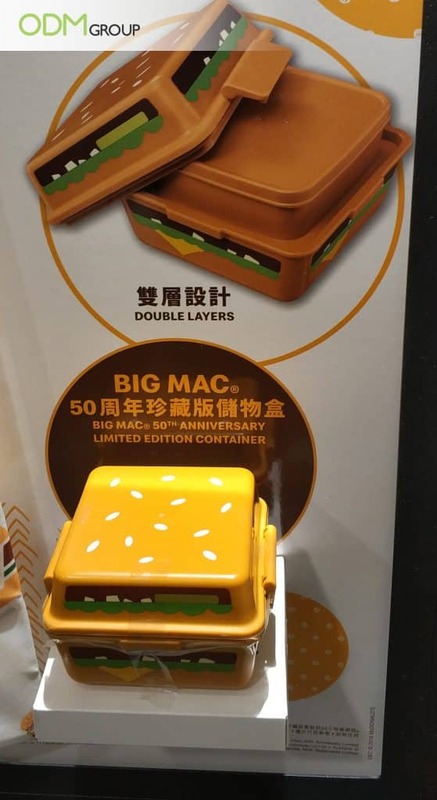 Meanwhile, the promotional plastic container is printed and shaped like a Big Mac. It is certainly an eye-catching design that is bound to tempt consumers into purchasing. Why We Find This Custom Gift Set A Spectacular Promotional Offer? High customizability – with the ability to customize their products, Mcdonald’s is able to greatly differentiate their brand from their competitors. Moreover, it is one-of-a-kind and limited edition. This will induce the scarcity effect due to the fear of missing out on a good deal. Hence, the scarcer and extraordinary the item is, the more valuable the product becomes to the consumer. So they will have the tendency to get the product regardless of whether they truly need it. Practicality – both shopping bag and the container are everyday items that people use regularly. Although they are typical items that are used in contest giveaways or promotional offers, it still remains as a highly sought-after item due to its utility value. Hence, brands with low marketing budget should consider this option. Enhances Brand Image & Loyalty – By extending their gratitude towards consumers, it shows brands’ appreciation. Similar to the custom ceramic bowl giveaway which was a collaboration between Mcdonald’s and Sanrio, brands can also consider coming up with branded gift with purchase to further heighten sales and brand image. Distinctive Design – With such a well thought out design, it will reinforce brand association to Mcdonald’s Big Mac burgers and boost visibility. However, with so many competitors in the market, a suggestion would be for Mcdonald’s and brands to print their logo somewhere to make a lasting impression on consumers. Overall, rewarding customers for their continuous patronage and support for the brand will certainly retain better customer loyalty. At ODM, we have vast experience in product designing, custom retail packaging design and manufacturing high-quality promotional products and POS display units. We can schedule product brainstorming session to come up with ideas for your next marketing campaign that will definitely see success. With our dedicated team of product designers at Mindsparkz, we can also provide you with satisfactory design services. Send us an inquiry today!